The camera lens is an invention that attempts to duplicate the operation of the human eye. Just like the eye, the lens sees an image, focuses it, and transmits its colors, sharpness, and brightness through the camera to the photographic film, which, like our memory, records the image for processing and future use. Lenses are made of optical glass or plastic. They focus light rays by refracting or bending them so that they meet or converge at a common point. A simple lens "sees" well through its center, but its vision around the edges tends to blur. Blurring, color changes, distortion of lines, and color halos around objects are caused by defects in the lens called aberrations. Some aberrations can be corrected in the simple lens by shaping one or both surfaces so they are aspheric; aspheric curves vary like the curves of a parabola, rather than staying constant like the curvature of a sphere. A camera lens reduces the effects of aberrations by replacing a simple lens with a group of lenses called lens elements, which are lenses of different shapes and distances of separation. The lens becomes more complex as greater correction of vision is achieved. The lens will also be more complex depending on the size of the aperture—the opening that allows light to pass through—and the range of angles it "sees." Lens design used to rely on the optician's art and considerable experimentation. Today, computer programs can adjust the shaping and spacing of lens elements, determine their effects on each other, and evaluate costs of lens production. Lens elements are usually described by their shape. The convex lens curves outward; a biconvex lens curves outward on both sides, and a plano-convex lens is flat on one side and outwardly curved on the other. There are also concave lenes, biconcave, and plano-concave lenses. The elements are not necessarily symmetrical and can curve more on one side than the other. Thickening the middle of the lens relative to its edges causes light rays to converge or focus. Lenses with thick edges and thin middles make light rays disperse. A complex camera lens contains a number of elements specially grouped. The combination of the composition, shape, and grouping of the elements maximizes the light-bending properties of the individual elements to produce the desired image. The lens is focused by moving it nearer or farther from the film or focal plane. The lens can be twisted, causing the lens elements to move in and out along a spiral screw thread machined into the casing of the lens. Twisting the lens also moves a scale on the casing that shows the distance of the best focus. The stop or diaphragm is a specialized part of the lens. In simple cameras, the stop is a fixed stop or a ring of black sheet metal that is permanently set in front of the lens. Box cameras, studio cameras, and some cameras of European manufacture use a sliding stop, which is a strip of metal that slides across the front of the lens between grooves. It has two or more holes of different sizes that are the apertures. Lenses with a variable stop have a machined ring on the outside of the lens mount, printed with f-stop numbers. By turning this ring, the diaphragm can be opened or closed. This iris diaphragm works much like the iris of the eye in allowing adjustments for varied light conditions. The lens in a compact camera is usually a general-purpose lens with a normnal focal length that takes pictures of an image the way our eyes see it. Lenses designed for special purposes are used with more advanced cameras. Telephoto lenses work much like binoculars or telescopes, and make a distant image appear closer. Wide-angle lenses make the image appear farther away; a panoramic lens is a special kind of wide-angle lens that is useful for taking pictures of broad expanses of scenery. Some disposable cameras are equipped with panoramic lenses. A fish-eye lens is also a special kind of wide-angle lens that deliberately distorts the image so the central part is enlarged and the outer image details are compressed. Fish-eye lenses cover very wide angles like horizon-to-horizon views. Another special purpose lens is the variable-focus lens, also called a "zoom" lens. It uses moveable lens elements to adjust the focal length to zoom closer to or farther away from the subject. These lenses are complex and may contain 12 to 20 lens elements; however, one variable-focus lens may replace several other lenses. Some compact cameras also have limited zoom, telephoto, or wide-angle features. The single-lens reflex (SLR) camera is made so that the photographer sees the same view as the lens through the viewfinder. This enables the photographer to plan the image that will appear on film with the flexibility of a variety of interchangeable lenses. The camera lens evolved from optical lenses developed for other purposes, and matured with the camera and photographic film. In 1568, a Venetian nobleman, Daniel Barbaro, placed a lens over the hole in a camera box and studied sharpness of image and focus. His first lens was from an old man's convex spectacles. The astronomer Johann Kepler elaborated on Barbaro's experiments in 1611 by describing single and compound lenses, explaining image reversal, and enlarging images by grouping convex and concave lenses. In the 1800s, the first box cameras had a lens mounted in the opening in the box. The lens inverted the image on a light-sensitive plate at the back of the box. There was no shutter to open the lens; instead, a lens cap was removed for several seconds or longer to expose the plate. Improvements in the sensitivity of the plate necessitated ways of controlling the exposure. Masks with different sized openings were made for insertion near the lens. The iris diaphragm was also developed to control the aperture. Its metal leaves open and close together to form a circular opening that can be varied in diameter. In 1841, Joseph Petzval of Vienna designed a portrait lens with a fast aperture. Previously, lenses made for daguerreotype cameras were best suited for landscape photography. Petzval's lens allowed portraits to be taken ten times faster, and the photograph was less likely to be blurred. In 1902, Paul Rudolph developed the Zeiss Tessar lens, considered the most popular ever created. In 1918, he produced the Plasmat lens, which may be the finest camera lens ever made. Rudolph was followed shortly by Max Berek, who designed sharp, fast lenses that were ideal for miniature cameras. Other essential developments in lens history include lens coating technology, use of rare-earth glass, and calculation methods made possible by the computer. Katharine B. Blodgett developed techniques for thin-coating lenses with soap film to remove reflection and improve light transmission in 1939. C. Hawley Cartwright continued Blodgett's work by using coatings of metallic fluorides, including evaporated magnesium and calcium that were four-one-millionths of an inch thick. A group of lenses called lens elements, which are of different shapes and distances of separation, make up the camera lens. Lens design used to rely on the optician's art and considerable experimentation. Today, computer programs can adjust the shaping and spacing of lens elements, determine their effects on each other, and evaluate costs of lens production. options, however. In selecting materials, the engineer must consider a range of metals for the components and various types of glasses and plastics for the lenses, all the while mindful of the final cost to the photographer. When the designer has completed the design, its performance is tested by computer simulation. Computer programs that are specific to lens manufacturers tell the designer what kind of image or picture the lens will produce at the center of the image and at its edges for the range of lens operation. Assuming the lens passes the computer simulation test, the criteria for performance that were chosen initially are reviewed again to confirm that the lens meets the needs identified. A prototype is manufactured to test actual performance. The lens is tested under varying temperature and environmental conditions, at every aperture position, and at every focal length for zoom lenses. Target charts in a laboratory are photographed, as are field conditions of varying light and shadow. Some lenses are aged rapidly in laboratory tests to check their durability. Additional design work is needed if the lens focuses automatically, because the auto focus (AF) module must work with a range of camera bodies. The AF module requires both software and mechanical design. Extensive prototype testing is performed on these lenses because of their complex functions and because the software is fine-tuned to each lens. 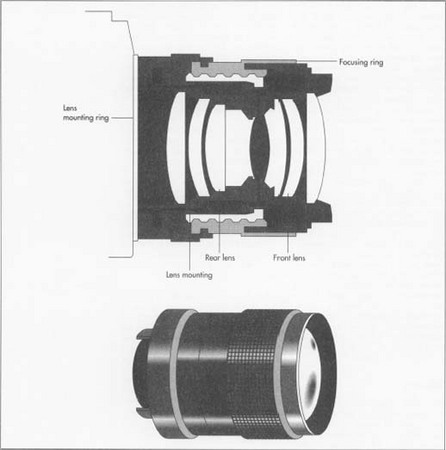 The raw materials for the lenses themselves, the coating, the barrel, or housing for the camera lens, and lens mounts are described below in the manufacturing section. 1 Optical glass is supplied to lens manufacturers by specialized vendors. Usually, it is provided as a "pressed plate" or sliced glass plate from which the elements are cut. The glass elements are shaped to concave or convex forms by a curve generator machine that is a first-step grinder. To reach the specifications for its shape, a lens goes through a sequence of processes in which it is ground by polishing particles in water. The polishing particles become smaller in each step as the lens is refined. Curve generation and subsequent grinding vary in speed depending on the frailty, softness, and oxidation properties of the optical materials. After grinding and polishing, the elements are centered so that the outer edge of the lens is perfect in circumference relative to the centerline or optical axis of the lens. Lenses made of plastic or bonded glass and resin are produced by the same processes. Bonded materials are used to make lenses with non-spherical surfaces, and these lenses are called "hybrid aspherics." The aspherical surfaces of these lenses are completed during centering. 2 Formed lenses are coated to protect the material from oxidation, to prevent reflections, and to meet requirements for "designed spectrum transmission" or color balance and rendition. The lens surfaces are carefully cleaned before coating. Techniques for applying coatings and the coatings themselves are major selling points for a manufacturer's lenses and are carefully guarded secrets. Some types of coatings include metal oxides, light-alloy fluorides, and layers of quartz that are applied to lenses and mirrors by a vacuum process. Several layers of coating may be applied for the best color and light transmission, but excessive coating can reduce the light that passes through the lens and limit its usefulness. 3 The barrel includes the chassis that supports the various lens elements and the cosmetic exterior. Metal mounts, grooves, and moving portions of the lens are critical to the performance of the lens, and are machined to very specific tolerances. Lens mounts may be made of brass, aluminum, or plastic. Most metal barrel components are die-cast and machined. Metal mounts last longer, maintain their dimensions, can be machined more precisely, and can be dismantled to replace elements, if necessary. Plastic mounts are less expensive and of lighter weight. If the barrel is made of engineering plastic, it is produced by a highly efficient and precise method of injection molding. The interior surfaces of the barrel are also coated to protect them and to prevent internal reflection and flare. 4 Other parts of the lens, such as the diaphragm and auto focus module, are produced as subassemblies. The iris diaphragm is constructed of curved leaves cut out of thin sheets of metal. The metal leaves are held in place by two plates. One plate is fixed, the other moves, and has slots for sliding pins. These slide the leaves back toward the barrel to open the diaphragm or into the center to close the opening as the f-stop ring is turned. The diaphragm assembly is fastened into place when the lens mount is attached to the end of the barrel. The auto focus is also added, the optical elements are positioned, and the lens is sealed. After final assembly, the lens is adjusted and inspected rigorously. It must meet the design standards for optical resolution, mechanical function, and auto focus response. Lenses may also be tested by subjecting them to shocks, dropping, and vibration. Approaches to lens manufacture vary greatly among companies. Some use full automation including industrial robot s to make their products, others use large assembly lines, and still others pride themselves on hand-crafting. Quality and precision are essential to lens production, however, regardless of manufacturing approach. Incoming materials and components are rigorously inspected for quality and compliance with engineering specifications. Automated processes are also inspected constantly and subjected to tolerance checks. Hand-craftsmanship is performed only by skilled artisans with long years of training. Quality control and stress tests are incorporated in each manufacturing step, and elements and components are measured with precise instruments. Some measuring devices are laser-controlled and can detect deviations of less than 0.0001-millimeter in a lens surface or in lens centering. Camera lenses are enjoying new developments in many areas. The consumer's interest in the best photos for the lowest cost has led to disposable cameras with simple but effective lenses. Lenses for professional photographers and for specialized uses such as high-performance binoculars or telescopes are made with exotic and "non-preferred" glasses that are more sensitive, expensive, and harder to obtain than traditional materials. These are called "abnormal dispersion" materials because they merge all the colors in the light passing through the lens to produce the best images, rather than allowing colors to disperse like a simple lens. Water and other liquids also bend light, and scientists have identified liquids that are abnormally dispersive and can be trapped between layers of ordinary glass to produce the same image quality as exotic optical glass. The ordinary or "preferred" glass (preferred because of low cost and workability) is bonded around the liquid with flexible silicone adhesive. The resulting "liquid lens" may replace several elements in a professional-quality lens. It also reduces the coating required and the amount of lens polishing needed because the liquid fills imperfections in the glass. The cost of the lens is reduced, and the light transmission properties are improved. Lens makers in the U.S., Japan, and Europe are preparing to produce liquid lenses in the near future. Bailey, Adrian and Adrian Holloway. The Book Of Color Photography. Alfred A. Knopf, 1979. Collins, Douglas. The Story of Kodak. Harry N. Abrams, Inc., Publishers, 1990. Coy, Peter, ed. "A Clear-Eyed View from Liquid Camera Lenses." Business Week, January 17, 1994, p. 81. From Glass Plates to Digital Images. Eastman Kodak Company, 1994. "Photographic Lenses." Photographic, April 1991, pp. 56-57. "Liquid Lens." Popular Science, May 1994, p. 36.
what exactly are the lenses made of is modern cameras and what if known is the refractive index of the material? The coatings surrounding the lenses... what is the purpose/function and does the coating have an effect on the light rays or image produced by the camera? If you could get back to me.. that would be great.